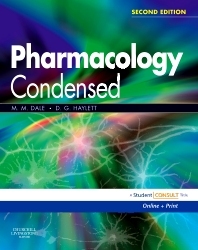 Pharmacology Condensed, 2nd Edition is a companion volume to Rang et al's Pharmacology, sets out to provide the reader with the quintessence of pharmacology, delineating, in text and summary diagrams, the key points of the information which will be needed later in professional life. It will help reinforce the facts and concepts in pharmacology that are essential in appreciating how drugs work and their underlying pathophysiological processes. Each of the 49 short chapters adopts a standard approach and the book includes many illustrations specially designed to summarise textual material. Within each chapter, several drugs may be mentioned but only the most important drugs from each group are set out in bold type. Readers using this book will gain a fuller understanding of the essential aspects of pharmacology. It will also be of considerable help in preparing for examinations. This book is best used with Rang Pharmacology but can also be used in conjunction with another pharmacology textbook.